Martial arts enjoy a permanent place in sport in the UK. We tend to think of Kung Fu and the far east when we think of martial arts but of course any sport that includes combat is, strictly speaking, a martial art. But it is the fighting forms of the East that have captured our imagination and nowadays you can find a karate or kick boxing club in any major town or city. Judo was probably the first martial art imported from the Far East to take a hold in Britain. Judo is an Olympic sport and is overseen in the UK by the British Judo Association. Karate, the Japanese and Okinawan method of self defence involving kicking and hand strikes has also long been settled in the UK. There are many different styles of Karate, such as Shotokan and Goju-ryu. Whichever style you choose, it is essential that you join a properly accredited club, martial arts can be dangerous and should be learned and practised with proper instruction, equipment and supervision. Tai-Kwon-Do is extremely popular in Great Britain and like Judo, it is also an Olympic sport. 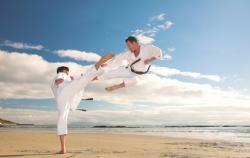 Tai Kwon Do, although a sport, places lots of emphasis on actual self-defence. It’s an ideal sport for children who can even start training as early as aged four!